Ultra-efficient 60 Watt Spare Bulb for the Bitron ECO range of Pond Ultraviolet Clarifiers. Genuine OASE Spare Part with a general lifespan of up to 12,000 running hours. 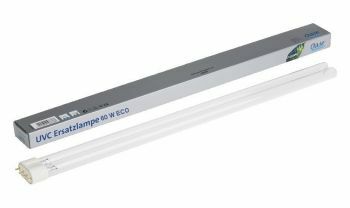 Bitron ECO 120 UVC (2 x 60w Bulbs required). Bitron ECO 180 UVC (3 x 60w Bulbs required). Bitron ECO 240 UVC (4 x 60w Bulbs required).